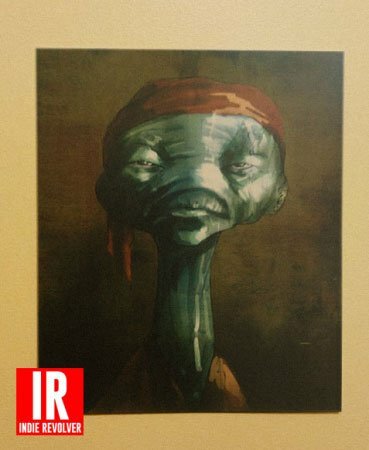 Indie Revolver - which has been a reliable source where Star Wars: The Force Awakens concept art has been concerned - has revealed this new piece, identifying it as Lupita Nyong'o's character Maz Kanata in the film. The character has been described as a pirate - perhaps setting her up as a Han Solo-esque rogue in the Star Wars canon - and she evidently control's an entire castle. It is here that "Galactic travelers, smugglers, and other assorted riffraff" all gather. Sounds quite a bit like the Mos Eisley Cantina from Star Wars: A New Hope, no? The folks behind the production of Star Wars: The Force Awakens - particularly director J.J. Abrams - have regularly spoken about the desire to make the film as practical as possible, and only use CGI where it's really necessary. Looking at the design of Maz Kanata, one can understand why the filmmakers decided to go the motion-capture route. No amount of prosthetics and makeup would be able to turn the beautiful 12 Years A Slave Academy Award winner into the alien you see above. Thankfully, there are some pretty talented people working on Star Wars: The Force Awakens who know a thing or two about motion capture. This not only includes the many talented CGI artists that the production has employed, but also Andy Serkis - who is a bit of a legend in that particular field. In fact, he may very well be playing a motion capture role in the film himself, though that has not yet been confirmed either way. In the months ahead, one can imagine that we will eventually get to see Maz Kanata pop up in the marketing for Star Wars: The Force Awakens, but it may currently be too early in the process to reveal the full CGI look. Be sure to stay tuned for more updates in the coming months - particularly towards the end of the summer and the beginning of fall - and look for the seventh chapter in the Star Wars saga to hit theaters on December 17th.